In compliance with recommendations of The National Institute of Research and Safety at work. 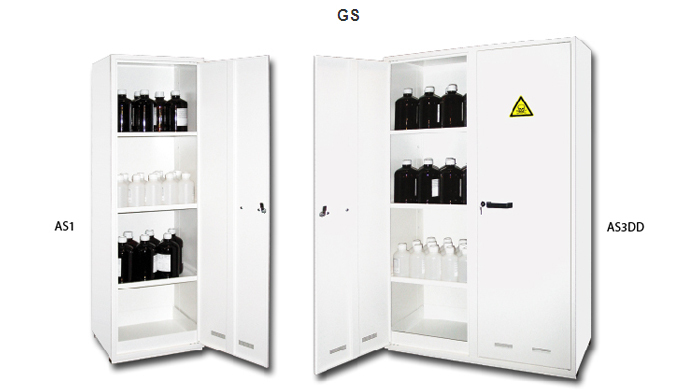 Inexpensive solution for your dangerous products storage. Available in 3 versions : "Flammable", "Corrosive" or "Toxic" products. "Flammable", "Corrosive", "Toxic" or "Harmful" large warning labels. Removable retention tank at the bottom (100 mm height). .
- double grating air inlets in the bottom of the doors. - top air outlet Ø 100 mm with grating. Retention shelf and tank in PVC for corrosive products. Industrial absorbent mat for retention tank (Ref. JF10D). *CAUTION! For double doors models 2 pieces by level are required.